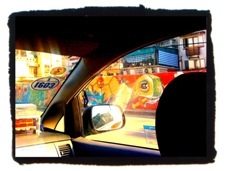 In a flash, HaNoi’s Ceramic Mosaic Mural as seen from the taxi, October 2010, iPhone photos © 2010 by ybonesy, all rights reserved. 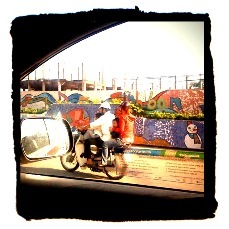 Entering the city of Hanoi last week, I immediately notice that the ceramic wall is done. This four-kilometer-long work of art, which has been in progress for the three years since I started visiting here, runs along the city’s Red River dyke system. Earlier this month, just in time for last week’s celebration of Hanoi’s 1000th birthday, the completed wall officially became the world’s largest ceramic mosaic, as recognized by Guinness World Records. We are very proud to have successfully gained a Guinness World Record achievement. This project reflects the vibrancy and complexity of Vietnam’s capital city, and is the ideal way to commemorate Hanoi’s 1,000 year anniversary. The integration of international artists and children’s art depict many different moods, cultures, eras of history and styles, and they have all been created with the greatest craftsmanship. We hope that this achievement brings pride to Hanoi and that the people of the city enjoy the mural’s beauty for many years to come. The collective public work of art—Vietnam’s first—began in 2007. The mural is organized in 21 sections and was designed by 35 professional artists from ten countries and supported by hundreds of artisans from traditional ceramic villages in Vietnam, Vietnamese and other children, and students from fine arts colleges throughout the country. 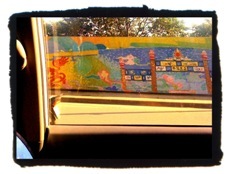 The murals depicts Vietnam’s landscape and peoples, and is said to be a visual narration of the country’s history. The mural embodies the country’s rich tradition in ceramics, of which I barely scratched the surface during a day of sightseeing to the town of Bat Trang. The entire village, it seemed, was dedicated to the making and selling of gorgeous plates, cups, vases, sculptures—you name it, they made it. 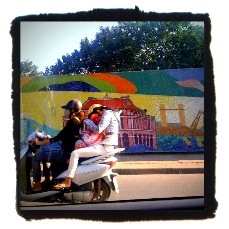 More than anything, Hanoi’s Ceramic Mosaic wall reminded me of the color and buzz and energy of Hanoi and all of Vietnam. You can read and see more about the wall, including video clips showing artists working on the mural, in the official Hanoi Ceramic Mosaic Mural website. 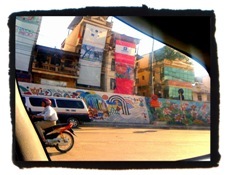 The Hanoi Ceramic Mosaic Mural blog includes many interesting photos, such as the original Photoshop artist renderings of the mural back when it was only a concept. That site also talks about the artist and staff of the project. 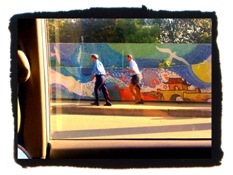 Finally, this Travel Blog entry includes close-up photos of the wall in progress. 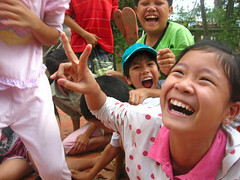 Exactly three weeks have passed since the girls (my daughters and my nieces) and I made the journey back from Vietnam. 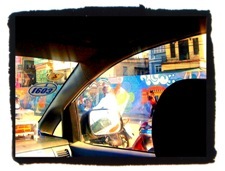 It feels like a dream, those days walking through Saigon and feeling the energy of the city. The beach city of Nha Trang is my new favorite spot, and I’ve been to many wonderful places in the country. One of the things I noticed about the trip was that I didn’t have much time alone, and yet I was not torn between solitude or not solitude. I relished the hours spent with my family. We traveled together well. We shared a similar sense of adventure. I would love to share in this blog post a story or two about our trip, but I’m in the middle of writing a print publication essay about exactly that. So I’m at a loss of what to say. 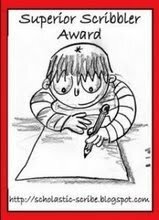 Unfortunately, I need to save all my best words for the essay. I can share this screen shot below from the last essay of mine that was published, this in SAGE, a monthly magazine for women that appears as part of the Albuquerque Journal. It came out while we were in Vietnam, which was fun timing since the writing happened to be about one of my previous trips to the country. You might recognize the photo from one of my previous blog posts. It was especially cool that three of my photos got published along with my writing. The country has become as much a muse for my writing as my art. That’s a recent shift. I wonder, when I sit down and think about it, how many essays about my travels there I have in me. Maybe quite a few. 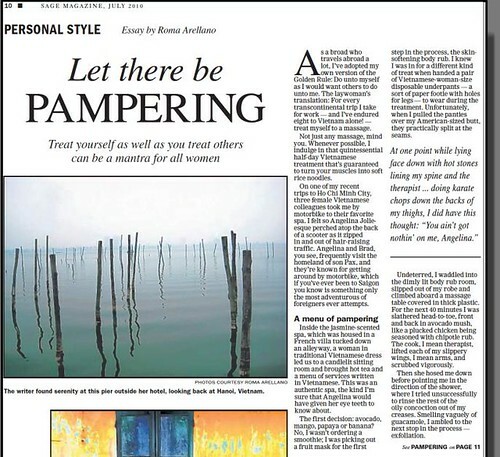 Let there be Pampering, by Roma Arellano, screen shot from SAGE, The Albuquerque Journal, July 2010, © 2010 by The Albuquerque Journal. Our guide was named Anh. Like Anne, but a long a. Ah. Ah-n. She had the look of a backpacker. At first. When I took in the rucksack and light jacket, I thought maybe she was a trekker who’d landed her dream job. Tour guide on a medium-sized wooden boat, fits about 20 passengers, floating up and down the Mekong Delta. But first impressions are deceiving. Anh was from Hanoi originally, now living in Can Tho. She wore thick flesh-colored socks with sandals. A face mask and a traditional Vietnamese hat to keep the sun off her skin. 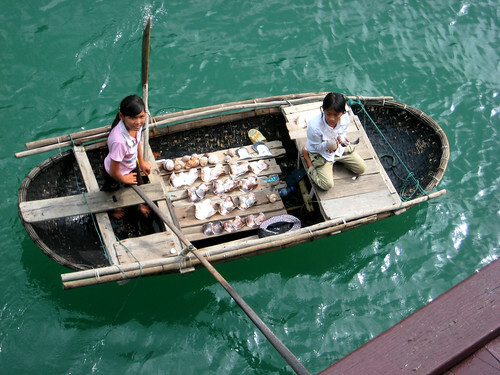 In Vietnam, the women want to remain as fair-skinned as possible. Stark contrast to the Norwegians who shared the boat with us. The two women in that group tied silk scarves over their bathing suits and sat in the hot sun until the silk turned dark with sweat and their skin a sort of freckled orange-brown. My friend Marcia says that eventually, given enough time, we will all evolve to look like one another. 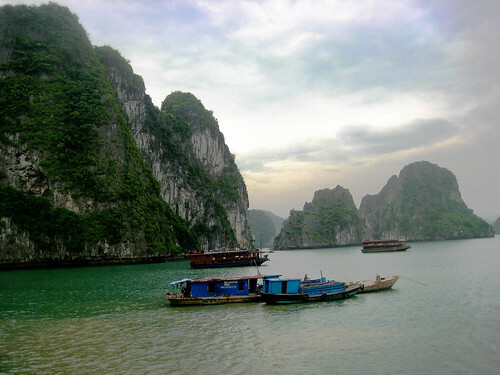 Vietnamese women will get lighter; fair-skinned Norwegians will turn a crispy brown. We’ll all go after the universal beauty ideal. Add a KFC on every corner of every city in the world and Wham-o!, we’re all the same. Until then, I will enjoy our differences. And prawns with attached heads, which we had for lunch. And cuttle fish, passion fruit, rice. Meals on the Bassac II are gourmet. How it turned out to be just me and the girls plus a Norwegian family of four—I don’t understand. This is the best boat ever, the best crew. The captain is the same one who steered the boat the last time I was on it, and both times he masterfully navigated our vessel through narrow passages where barges carrying silt dredged from the bottom of the river came within a foot of boats that are floating fish farms. And us. As we gawked at other people’s lives, all while eating steak and fish for lunch or sipping Tiger beer, I imagined we were a nuisance on this commercial waterway. The Vietnamese float by with all their worldly possessions contained in boats only slightly larger than canoes. 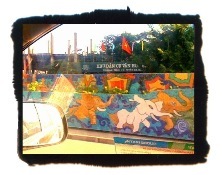 And yet, they are so tolerant, even nice to us as we float by in all our laid-back luxury. The crew of Bassac II recognized me when I boarded, and I reminded them that I said I’d return and bring my girls next time. 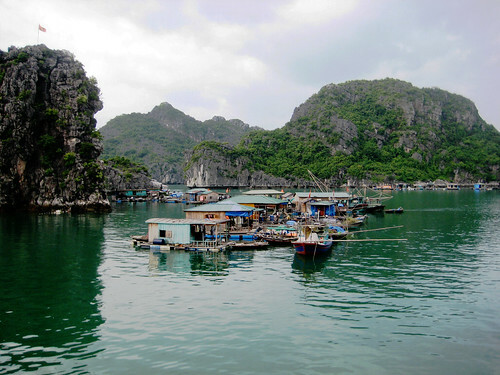 Dee was enamored by the boat immediately, the cool of the cabin and its smell of hibiscus and lemongrass. She wandered around the boat as if under a spell, that slow walk from this end of the deck to that one, all the while tracing her hand along the deep brown wooden railings. The place suited her internal clock, slow and content to not do much. Em explored every corner of the boat she had access to, bouncing a few minutes around the upper deck, then a few more on the deck below. “Mom, I’m going to check out the front of the boat,” she informed before shooting off again. She waited impatiently for hours, unable to just rest, before we finally boarded the canoe and made our way to a village along one of the canals. Not being from Can Tho, Anh didn’t know the off-the-beaten-path spots where you could find a temple that wasn’t officially on the tour. Nor did she have the same sense of adventure that prompted our last tour guide to stop in at a Cao Dai temple while making our way back to the boat from the village. But that was fine. 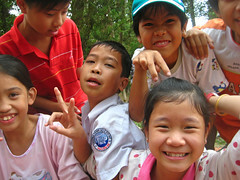 Anh was calm and friendly, and she loved the girls. She spent a generous amount of time in the floating market, took us to a cottage factory that produced soy sauce and salt, and let us sit for almost an hour eating exotic fruits while she showed the girls how to make jewelry and animals out of palm leaves. Here I am, crouching in front of a temple in Hue, surrounded by children. They squeal, I smile. They tug at me, I hug them. When my guide enters the courtyard and sees me, he marches toward me, beside himself. He pulls me up from the spot where I am, a small child like them. “Watch your purse,” he hisses. He’s not unkind. He just knows how children can be with tourists. But I’m not afraid. If they take something from me, more power to them. I shouldn’t be such a naive soul, should I?, for letting them dupe me like that. It’s the price I’m willing to pay to be with children, even if they’re not my own. But the truth is, these kids don’t even try to take my things. They want to test their broken English and throw me some universal signs. Peace, love, all that. 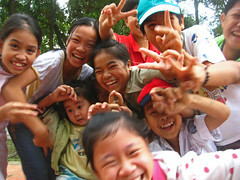 At this point on a trip to Vietnam, I need all the peace and love I can get. I notice children everywhere I go. I am beyond homesick. Fast forward to today. Em packs Froggy and Meow. Froggy is a frog pillow that presently rests in the space between me and Em. His green warmth at my side assures me as our plane lifts from the tarmac and begins its bumpy ascent. Dee packs no stuffed toys, although this morning she took Merry, the horse she’s had since age three or four, to stay with Jim for the almost three weeks we’ll be gone. We’ll be gone. Me and my girls. Finally. 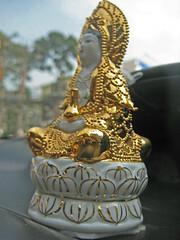 In Vietnam. This is something I’ve always done with my girls. Not the international travel, but whisking them away, the three of us sans Daddy. I’ve taken them to Ghost Ranch in Abiquiu, where we tried unsuccessfully to put up a tent in the wind and ended up walking into the administration office and sheepishly asking for a room. We’ve been to Santa Monica, at the Hotel California, and when we drove into the parking lot from the airport—you won’t believe it!—that Eagles tune was playing on the rental car radio. 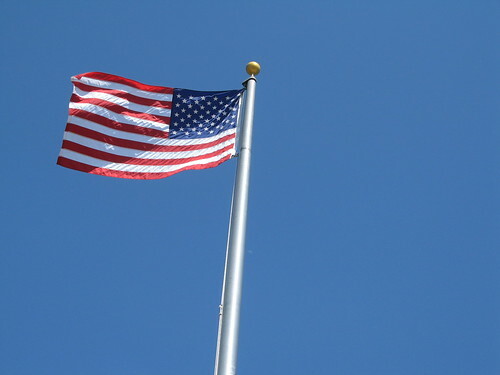 We’ve gone to Denver, with my sister and her kids, and also taken a road trip with them to San Francisco via Las Vegas. In Taos, the girls and I stayed in Mabel‘s room at the Mabel Dodge Luhan House, and I didn’t tell them that my blog partner had once seen the ghost of Mabel in that very same room. 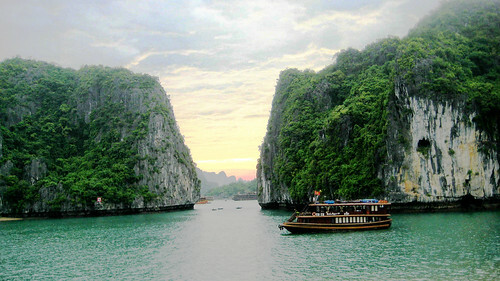 But those adventures pale in comparison to the three plane rides it will take to get us to Ho Chi Minh City. One of the flights is 13 or 14 hours long. I try not to dwell on it but wonder if I’ll be able not to when I have an 11-year-old and a 14-year-old sitting next to me. Not to mention Froggy. And this is just the beginning. I can’t wait to see my girls’ reactions when I take them to the crowded colorful market where women tug at your sleeve and say “Madam, Madam!” or when we eat a steaming bowl of rice noodles and chicken for breakfast or morning glory sauteed in garlic for lunch. Will they agree that Vietnamese food is the best in the world? We’ll float down the Mekong Delta, travel by domestic plane to a beach town I’ve heard about but never been to, stay in a luxury two-bedroom apartment right in the heart of bustling Saigon. All month long as the trip looms closer, I drive them around our hometown and tell them that driving on the streets of Saigon is nothing like Corrales. I want them to feel the chaos, the aliveness of it all. To see how a place half a world away wakes up, eats, lives, go to sleep. Is. We are on the plane now. Em shows me a photo she just snapped with her cell phone camera of the landscape out the window of our plane, somewhere west of the Grand Canyon. The image on her small screen resembles those photos of Earth as seen from outer space. There’s the curve of the terrain, layers of atmosphere growing from light to dark blue as you move away from the land toward the expansive sky. This is like us, I think, in the world, high above it all. On our way to places beyond. 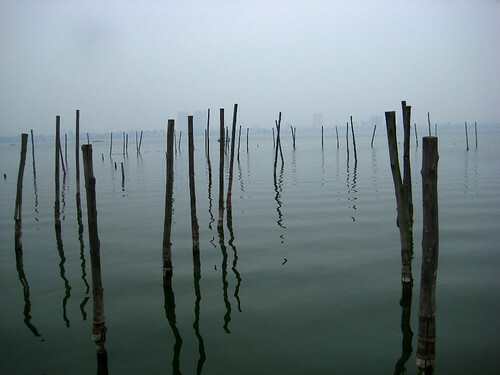 Lagoon on West Lake of Hanoi, view from the lakeside pier at our hotel (Hanoi in the distance), January 2010, photo © 2010 by ybonesy. All rights reserved. what lies beneath the water? Coming back to my life in New Mexico is a re-entry of sorts. At first the transition is gentle. Jim has a dinner of pork loin, baked potatoes, and peas and corn waiting the first evening, and I sleep from 8 pm until 11:30 the next day. Day Two is another reprieve—soft hugs from daughters and Jim’s homemade chicken pot pie—before I’m fully reabsorbed into the fabric of daily life. After the second night I am a full-time mom once again. I take my oldest shopping for a dress to wear to Winter Dance then plan a menu involving potato-leek soup. I want to sleep during the day but I don’t indulge my longings. If I take a nap, I risk not being able to wake up without feeling like I’ve just emerged from a 100-year slumber. Something I’ve learned from my trips abroad: unpack within 24 hours of landing and put away my suitcase; else, it will sit on the floor for weeks, a trip hazard in the night when I wake up at 3 am and decide to get up. To avoid hitting an underwear shortage mid-week, I wash and dry, if not fold, my laundry. Connect with friends and family. Pick up where I left off on commitments. Each one of these actions helps me be fully present now that I’m back. There is something about traveling abroad that suits me immensely. 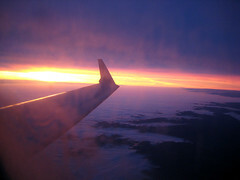 I love the solitude of sitting on a plane that’s bound for somewhere far away and feeling like I’m self-contained. It’s not unlike the feeling of freedom that comes from getting into a car and leaving town for a long road trip. How exotic to arrive at nightfall to a town where you’ve never been, to eagerly await morning so you can see what lies beyond. Even so, I would not trade where I am this moment for anything else. There is nothing more comforting than sitting in my small writing room, my daughters tucked into bed, Jim making a late snack of the beans and ham hock that I cooked tonight. From the moment I leave my family until the moment I return, I think about them. 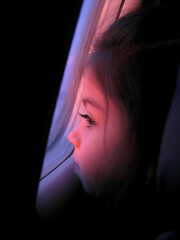 I notice other children, kids in transit. I smile at fussy babies on the plane. On this trip I even offered to the young parents behind me on the flight from San Francisco to Hong Kong that if they needed someone to hold their infant son, I’d be glad to help. They never did take me up on my offer. Tonight, when I can place everyone I love in relation to myself, I’m content. I am home. in collection © 2009-2010 by ybonesy. All rights reserved. Once upon a time, soon after the Việt people established their country, invaders came. The Jade Emperor sent Mother Dragon and her Child Dragons down to earth to help the Việt people fight against their enemy. Right at the time invaders’ boats were rushing to the shore, the dragons landed down on earth. The dragons immediately sent out from their mouths a lot of pearls, which then turned into thousands of stone islands emerging in the sea like great walls challenging the invaders’ boats. 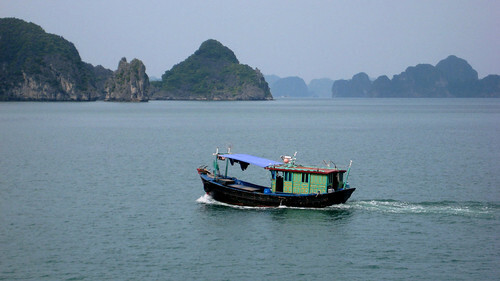 The fast boats couldn’t manage to stop and crashed into the islands and into each other and broke into pieces. After the victory, Mother Dragon and Child Dragons believed this country to be so beautiful that they didn’t return Heaven but stayed on earth at the place where the battle had occurred. 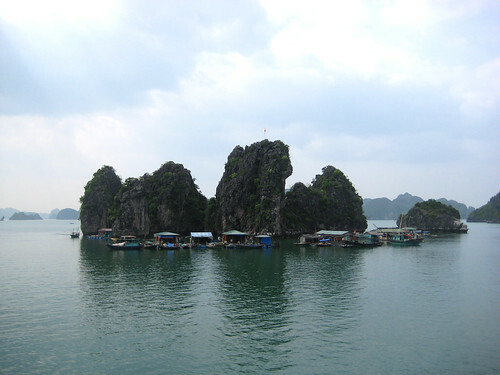 The location Mother Dragon landed is now called Hạ Long Bay and where Child Dragons descended is now Bái Tử Long. 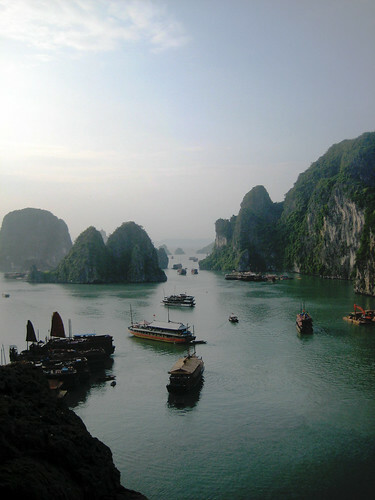 The dragons’ tails waving the water created Long Vĩ (present Trà Cổ peninsula) and formed a fine sand beach over ten kilometers long. Every time I come to Vietnam, I try to see a part of the country that I don’t know. 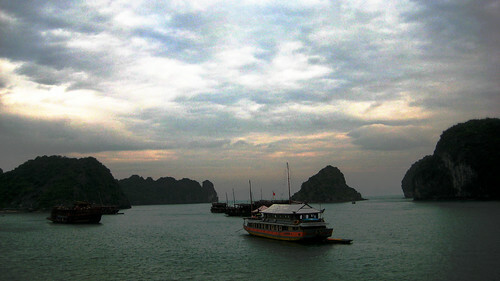 Last trip, August 2009, I went north to World Heritage Site Ha Long Bay, in the Gulf of Tonkin. The photos speak for themselves. Sometimes I wonder, How did I get so lucky as to come to know this beautiful country and its compassionate people? I’m curious. Do you believe in luck? Do you ever marvel at your good fortune? Do you curse bad luck? Let me know if you get a chance.